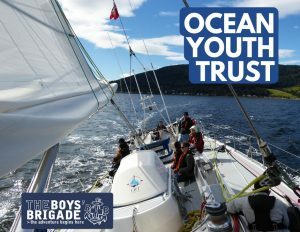 The Boys' Brigade has organised a number of voyages for young people and leaders in the past with the Ocean Youth Trust Scotland. This year OYT has provided The Boys' Brigade with some new opportunities for both young people and leaders. An exciting chance for BB adult leaders to step onboard our boats for a weekend and see 'what it’s all about'. OYT Scotland is offering the chance for leaders to have a weekend learning all about our programmes and the different options for them; how they would suit your young people; and just how affordable they might be. What's even better - you actually get to go sailing! The charge of this weekend is simply to cover the cost of food, so OYT would ask for a contribution of £50 per person for the weekend. The dates available are - 5th to 7th April or the 12th to 14th April. Both weekends start and finish in Greenock. Due to funding secured OYT is offering groups from The Boy’s Brigade hugely subsidised voyages, these five-day voyages are now being offered at £3,000 (the delivery cost for them is £10,720). This would be for either 10 young people and one or two group leaders, or if you feel it is suitable you could send 12 young people unaccompanied. There are a number of groups who do this as it both makes the cost per young person lower but it is entirely your decision. On this voyage OYT could offer an SQA Employability Programme, great both for those looking to boost their CV but also for those looking to develop their confidence and leadership potential. Or we could run a personal development programme for younger students looking to build their resilience and self-esteem. If groups find that they have individuals keen but not enough to fill a boat, two groups could come together, or offer spaces on the Individual voyages for 12-15 year olds and 16-24 year olds. These voyages are longer at seven days and a great chance to meet new people and enjoy a huge adventure. Normally charged at £810 per person , these are being offered at £510 per person.